Halfway through its second season, HBO’s Crashing continues to present an intimate window into the insular, communal tribalism of New York’s stand-up comedy scene. In the hands of creator/star Pete Holmes and executive producer Judd Apatow, those struggles manifest through equally generous helpings of joy and pathos: Holmes plays a dramatized and more naïve version of himself, drifting among fellow comics while looking for a place to crash, someone to eat with, or pieces of advice about comedy, fidelity, and God. His first mentor in the series is comedian Artie Lange, who, in season one, taught Holmes much about the business before he started using hard drugs again and disappeared. Like most stories on the show, it parallels the actor’s reality: Lange has struggled with addiction since that episode aired in early 2017, with a string of heroin-related arrests and medical emergencies. Last month, in his first interview since cleaning up, Lange told the Daily Beast that Apatow saved his life. This Sunday night’s episode of Crashing, “Artie,” co-written by Apatow and Holmes, portrays what it’s like for Lange to live with his disease with a frankness seldom seen on television. Earlier this week, Apatow and Holmes spoke to Vulture about working with Lange, how he showed up to act out his own painful experiences, and what it means to portray addiction with honesty and artfulness. You have a very special episode airing this weekend. How does it feel to put it out into the world? Judd Apatow: We talked to Artie when we were shooting the show last summer and said, you know, we have an opportunity to talk about his struggles in a way that would be honest, and allow him to let people know how painful it is to have to deal with this type of addiction. He recently had some health issues and went to rehab and is doing well right now, but I think it’s very hard for him. I said, “I think it’s important to tell people you don’t wanna have this happen to you, and to stay away from this at all costs.” Artie was very brave about being willing to address this creatively. Pete Holmes: Yeah, that was my experience too. Judd, who’s obviously very brave and smart, said, “Let’s deal with this very uncomfortable issue,” and then the first thing we did was talk to Artie about it. Artie, who’s also very brave and artistic, was totally onboard. I was super happy that he wanted to get as real and as raw as the episode gets because both he and I experienced that, in dramatizing it, there’s almost something therapeutic about it, seeing his life from an outside perspective. It’s almost like role-play. We have this conversation on camera that we want to have, and have had, off camera. That was Judd’s beautiful instinct, to bring that thing that’s supposed to be taboo, something you’re not supposed to talk about, into the show to get the message out. Crashing seems to serve as a vessel for comedians to tell these stories about themselves. It’s a standard for transparency not unlike the recovery process. PH: Yeah, totally. Judd and I are invested, obviously, as friends of Artie. But also people that watch him — that’s Artie’s wonderful presence on camera. You care about this person, are invested in him and his story. It’s a unique opportunity to tell the full picture, and hopefully have people get something out of it. Therapists often talk about the “mascot” in an addictive relationship, someone who resorts to comedy in order to put a lighthearted Band-Aid on issues that might require something else. Is there something particular about the mind of a comedian that pairs with addiction? JA: I don’t know if it’s connected. Comedians like to be open about their struggles, and I think that you can have this disease of addiction and still be a creative, kind, giving person. We love Artie and he’s been a great friend to us. I feel this is a great way for him to give back to people. He said to us, “I wish I could take back that day when I first tried heroin. I would do anything if I could have that day not happen.” Collaborating on this episode with us was his way of warning others. We all care about him so much and have so enjoyed working with him, because it’s been a fantastic experience. He’s been very reliable on our set, he takes the work very seriously, and he’s not afraid to look inward for stories and comedy. PH: One of the jokes we have on set is, I told Artie he should name his next book Consummate Professional, because everyone will think he’s joking. Our experience was [that] he was so onboard for Crashing and never messed anything up for us, only added value. 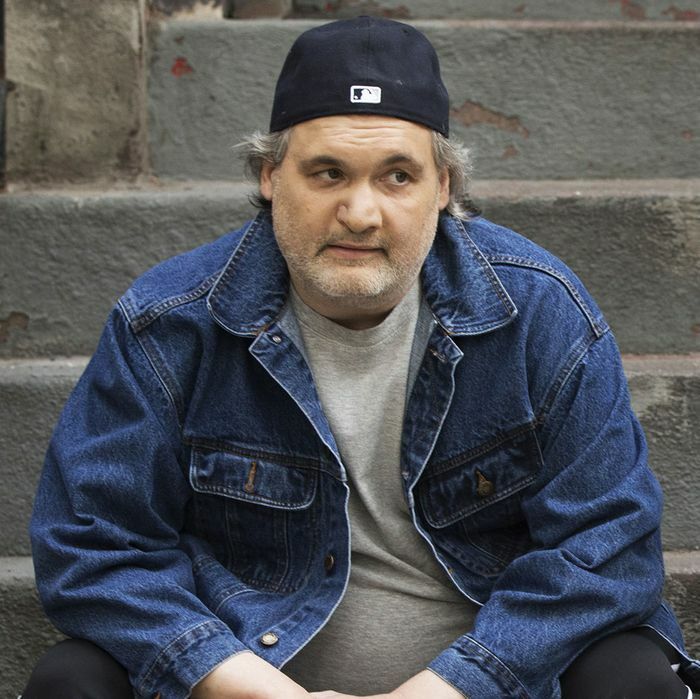 What’s interesting here — the artistry of Artie is, when he was talking about his addiction in a book, on [Howard] Stern, or his own podcast, it’s different from playing a scene where he is low. We’re asking more of him, and I think you get more of that experience by seeing him act it out. He’s such a wonderful actor, and the reason he’s a wonderful actor is because he’s willing to not just talk vulnerably, but act vulnerably. We had to do that scene over and over, and in between each scene Artie and I would just hug each other. I’m such a sensitive person that I told Artie, “We’re fighting, but you know I love you,” because it felt so real and the things we were saying were getting harsher and harsher. The final cut ended up being not so harsh, but we were going lots of interesting places because he’s such a courageous performer. That vulnerability is clear in the scene where Artie explains his problems with AA’s requirement to surrender to a higher power. It’s as if his acceptance of that higher power isn’t compatible with his comedic pragmatism or bluntness. PH: On our show, Artie is always playing the ghost of comedy future. He’s always showing Pete that there really is a lot of real suffering, pain, and loss, and to be careful. But in that moment when they’re eating pizza, even though Artie could be saying, “You’re crazy, your problems aren’t as bad as mine,” they actually find solidarity. Though it’s less extreme, Pete’s crisis of faith is given respect by Artie, even though Artie’s story could trump anybody’s because his story has so many sad notes to it. Judd, your body of work has looked at addiction before. The last season of Love, particularly with Mickey’s character, and the Doc & Darryl documentary. Through years of addressing addiction creatively, what wisdom could you bring to this episode? JA: I don’t know if I have much wisdom. I try to be there for people, let them know I love them and that I’m there to support them. Part of what the episode is about is that usually that only gets you so far. The person who has a problem has to make the choice to make a change, and you can’t force that will upon them as much as you wish you could. PH: Something I’ve seen Judd do time and time again is use his influence and the respect that people have for him to directly and actively love and try to help people. I see it all the time, and I hope you don’t mind me saying — Judd is an advocate for a lot of people and a lot of causes, and I’ve seen [it] firsthand. Season one on the set, it was just a thing you never talked about. Judd, in this very loving way, used the respect that Artie has for Judd to help him, to talk about what’s going on. These are those moments when nobody knows what to say, and sometimes it takes a body of work and a heart like Judd’s to go, “I’ll be the guy that talks about it, and I’ll be the guy to get Artie to talk about it.” Because not talking about it doesn’t help at all. These types of things fester and grow in shadows. It’s been inspiring to me personally, and professionally, to watch Judd. He doesn’t use his influence to have people bring him sliced meats and a goblet of espresso. He’s actually on the ground trying to help Artie, as a friend, and as somebody that we are making a show with. PH: Totally! And I’m not just saying this to promote the show, but that’s what Crashing is about. So it’s funny to be making a show about Artie helping Pete. Everybody talks about comedy being backstabby, competitive, and ugly — and there are elements of that, for sure. But there’s also this beautiful side to it where people do help each other. We’re making a show about Artie helping me while Judd is doing his best to help everybody. Judd is certainly helping me, and we’re all trying to help Artie. There’s a beautiful side to it, and that’s one of the things I like to get out there — that it’s not all just showbiz jerks clawing their way to the top. There’s a lot of heart to this community, and one of the things we’ve succeeded in this show is capturing that camaraderie, that repartee that they have. On another note, you guys put me in an Elliott Smith hole today with the outro music to this episode. JA: Seth Avett from the Avett Brothers put out an album with a friend of his that’s all Elliott Smith covers. That’s where the track is from. The episode also does a really tasteful job at reframing addiction as a mental-health conversation. Artie has that line, “It’s a physical thing, it’s not an emotional thing,” that really packs a lot into one sentence. JA: Well, part of it is, this is about his perspective on it. It’s up to the audience to decide what is a rationalization, what is accurate, where he’s fooling himself. JA: Yeah, it was all done in collaboration with Artie. All the scenes we conceived with him, a lot of it was written in improvisations with him, and we wanted him to feel like it was saying exactly what Artie wanted to say. PH: Right. He was super generous. When we [asked], “What might you say that might not be true to get somebody off your back?” For Artie to be able to split himself in that way, and re-create it … it really is one of the more interesting episodes because there are moments [when] we leave it unspoken. Was that true? When he said this, was that real, not real? That’s how it is being close to someone who’s an addict. I’ve lost friends to heroin, and it’s refreshing to see these conversations in work that’s also digestible as entertainment. PH: I’ve lost friends as well, and it’s the sort of thing that’s just not funny. It never was funny, but it’s become urgent. There’s a real need to talk about it, because there are all sorts of different ways that people get involved in this stuff. It’s not all just going to the park to score. It can be more subtle. The more we can talk about it, the better.